Although the tower or keep has had visiting hours on the door we never found it open during those times, just like the windmills in Castilla La Mancha. But now the town hall has published new opening hours one presumes that its doors will be open as advertised. I eventually visited it during an interesting guided tour of the town with the local historian from the library. This was the main tower of Castillo de la Villa and is in what was the main and highest part of the town. 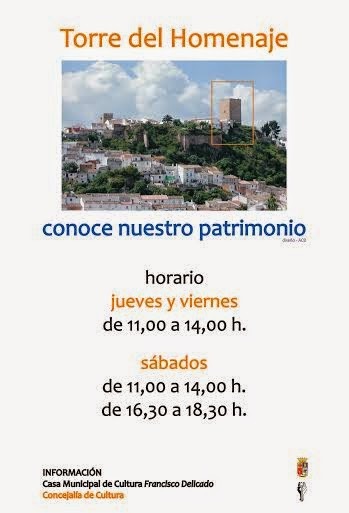 Having been restored over the years it is now a “Centro de Interpretación Cultural e Histórico de Martos” and part of the Castles and Battles Route which provides information about Martos and its history, and was declared a Historical Monument in 1985. Built in the XIV century by the Orden de la Calatrava the square tower has four floors, the basement being for rain water collection and storage, the others floors now house informative material and the top with views across the town is well worth the climb.